"525,600 minutes, 525,600 moments so dear. In 525,600 minutes -- how do you measure a year in the life? How about love? How about love? How about love? Love. Measure in love. Seasons of love." I've had her for three hundred and sixty five more days. Hundreds of thousands of minutes, countless moments, dozens of books and a myriad of chances to squeeze tighter, hold closer, give second chances and measure in love. Today, of all days, it happened to be her First Reconciliation. The irony of talking about sin and transgressions with someone who still believes in Santa and carefully writes notes to the Tooth Fairy and still sleeps with a multitude of stuffed of animals is not lost on me. She knows about making good choices. She knows how to be kind and thoughtful. She does it pretty much every day. I'm not too worried about her spiritual health. She's closer to God than almost anyone I know. a whole bunch of seven year olds made another step forward. In the glow of candles, amid family and friends, they spread out among four different priests and went up there and asked for forgiveness. Caroline was worried about this whole process and so her teacher helped her out. She asked her to hold a book. Then she piled another one on top, and another, and another -- until she was holding five heavy books. She told Caroline that when you do something wrong, it feels heavy and weighs you down. Then she swooped in and removed all the books. She told her that she would feel so much lighter after Reconciliation. As we walked up to church, Caroline wondered aloud if she would "feel lighter". She couldn't wait to find out. She wasn't fearful. She wasn't anxious. Afterward, she sighed and said, "I'm so much lighter!" The smile of a momma who had someone else give their child a gift. Someone else had given her another way to see the world. I was so so grateful. Walking home, I tried to hold her hand but she was skipping ahead. My heart is always lifted when she skips...but then it remembered the twenty who no longer skip...and the many, many heavy hearts surrounding those twenty. My heart always holds those twenty close. I can't look at Caroline and not see them. At her birthday, I thought of the quiet homes with no extra candle to add. When she lost another tooth; got bolder swimming; started voraciously reading. All of the days she spent singing, dancing, creating, laughing and telling knock knock jokes. Six moving to seven -- 525,600 extra minutes. What did I do with those precious extra? How did I spend them? I want you to know that your insane, mind-numbing loss is not forgotten. You are alongside us on our journey now...forever. and choosing love every chance we get. "There is something beautiful about all scars of whatever nature. A scar means the hurt is over, the wound is closed and healed -- done with." I don't often see Patrick without his shirt on. He's 14 years old and into privacy. He takes his own shower, figures out his own clothes, always remembers his deodorant and out of my three children that can maneuver through this process on their own, he is the only one who routinely hangs his towel up. So, it was with some surprise that I walked in on him looking at himself in the mirror, touching a rough spot on his chest, analyzing it and thinking about it. At 14, like almost all the others, he cares about what he looks like. He wants his hair to be cool. He loves to dress up with a tie and jacket. I could see him feeling his skin like a blind person reading Braille. He wanted to know the story behind the scar. He didn't remember receiving it. But, I did. The scar looks like a hashtag that might appear on Instagram. It's faded but rough to the touch. I touched it too...and like some sort of portal, I traveled back in time. There on the center of his chest, right next to his breastbone was the entrance to what once held a Broviac. A Broviac (for the lucky people who have never needed to know that word) is a way of giving chemo directly into your body. It also happens to be a way to take out blood as well. Pediatric oncologists often suggest it as the best option for young children with cancer because of that blood-taking option -- fewer sticks with a needle then. But from my viewpoint, I'd tell anyone to go for option two...the port-a-cath. John and I affectionately called the Broviac, the "X-files thingy" -- truly a scientific medical term if there ever was one. The Broviac was a tube that hung out of your chest. It required a tape over it and a netting to be worn like a vest over the entire chest so that it would not get pulled out. It was next to impossible to bathe in. It was hell to clean, not to mention life-threatening if we didn't clean it right. At the end of each week, we needed to push Heparin into the Broviac and clean the area around it. There Patrick would sit, the most stoic three year old on the planet, letting us clean raw skin and push medicine. All that is left of that awful, horrible time is the hashtag scar. Tonight, I told him the story of his bravery and his poise. I admitted that while I was afraid of it, he was not. and he asked about the next scar. This one was a three inch horizontal line about three inches down from his left hand collarbone. That was where the Port-a-cath was placed. After the x-files thingy came out...which was a Defcon 10 on my fear list, they casually replaced it with this. This beautiful invention goes under the skin. It's about the size of a fifty cent piece, circular, and attaches to a vein. It has a sponge-y center where the medicine goes in. You numb the area and then push the meds/chemo when needed. But since it is under the skin and nothing needs cleaning, once the meds are done, you're done. Free to go and live your life. Go swimming -- no problem. Take a bath -- a breeze. Play in a water slide -- fine by me! It was a miraculous transformation. Patrick was four when he got the port-a-cath placed and we were a new family. They "accessed the port" (don't we sound like we're in Star Wars?) whenever he had a chemo treatment, which was about once a month. Patrick was so zen and unafraid about the accessing that other children who were fearful would watch Patrick and see how easy it could be. He was fearless at four. Pretty stunning way to live. That scar tells that story and Patrick heard it tonight. except then I had to take my index finger and smooth his open heart surgery scar that runs right down the middle of his chest a good eight inches long and thick. Like I had a bubble of glue under a paper craft, I smoothed that skin, petted that scar and reminded him of that amazing badge of courage. That scar is hard to miss. He knows that story so I mostly skimmed over it, like a favorite fairy tale. I could give the Cliff Note version. He asked to see my scars. One from a hernia operation when I was two -- a whisker thin three inch scar way down low on my tummy -- and one on my finger -- a Girl Scout camping accident with a sharp tin can. My stories show no bravery. No zen-like calm. No resilience. No grace. Like ports of call on a map, Patrick heard his story. The hero stood down a foe. He maintained his cool. He bounced back from mortal adversaries and held his own. Mostly, he did it with effortless grace, good humor and kindness, fearlessly. What's a little hashtag scar or two when you've done all that? You're made of powerful stuff my boy. I'm glad you finally heard it all out loud. After all that horror, fear and dizzying sadness all that's left are the scars...and the stories. They're both pretty beautiful now. is to understand and to be understood." When you have a baby born with a disability, you enter a different world. I like to think of it as a parallel universe. The outside world audibly gasps. There is the smog of pity that envelopes you and makes it difficult to breathe. There are the many, many people who carefully, tenderly, kindly give you the "I'm so sorry," look or even utter those poisonous words out loud. I want to scream, "Sorry for what?" Sorry for this perfect snuggly bundle? This is the object of your sorrys??? I'd look down and it did not compute. I was on the inside now. Looking out at the world with this new view, it was as if I discovered the horizon line. suddenly fell away like shingles off of an old roof. What was essential, like Antoine de Saint-Exupery's famous quote, was invisible to the eye. On the inside, I could only see with my heart. Once your world is like this, you try to search for others. Like some lost tribe that is scattered, they are hard to find. In my town, not a single other child was born with Down Syndrome the year Patrick was born. I could find no one locally. So, in 1999, with the internet as an infant, I logged on and tried to find my tribe. I went to the National Association for Down Syndrome. 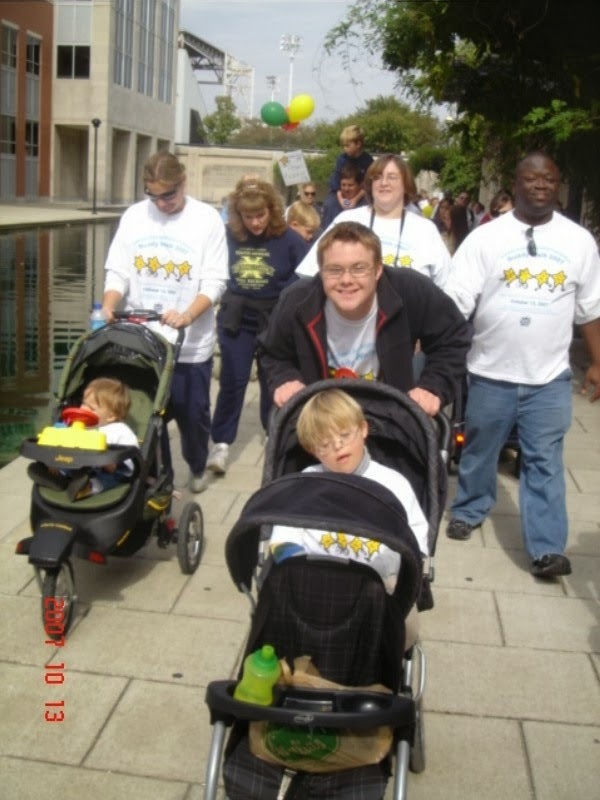 There I found a discussion board and a way to meet other families with children with Down Syndrome. I could post a question and people would answer right away. It was therapeutic and comforting and life-changing. I no longer felt alone. Within a few months, I found another board called ParentsPlace. It doesn't exist any more -- some big company bought it out and changed the format -- but at the time it was my tribe. I connected with families that had children close to Patrick's age. Some lived in California but others lived across the United States, in Canada and even in Israel. It was awesome! As the years kept on, we would talk about meeting each other "in real life". We called it an IRL. We dreamed of it, fantasized about it, idealized it and then reality forced our hand. One of our own was sick, real sick. Annette who had Ryan and lived in Canada had cancer. Her diagnosis was grim. Our friend Jan who lived in Indiana was willing to host anyone who could get to Indianapolis. 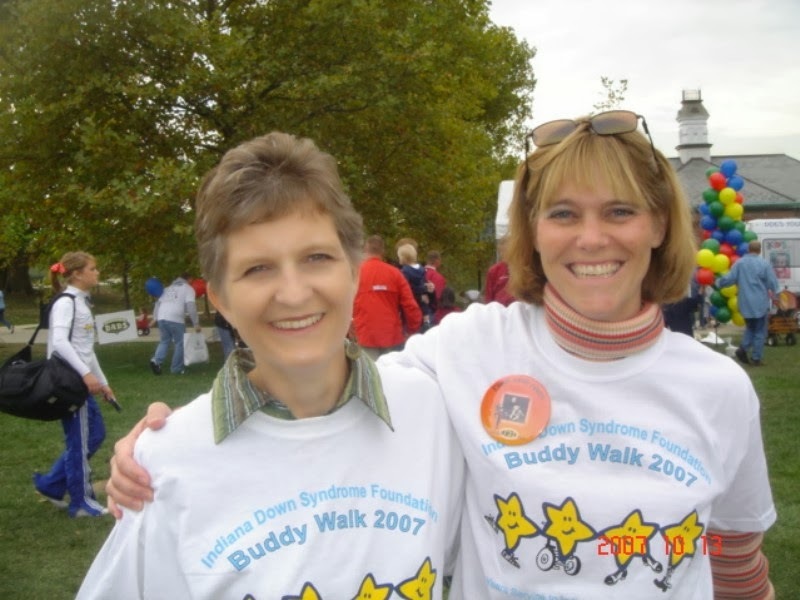 We would come out for the Buddy Walk in October and hope that Annette and family could make it too. I had been communicating with these moms online since 2000, sending Christmas cards, cheering at the victories of their kids, praying through the difficulties but never had I met them in person. I took Patrick out of school, convinced John to take time off of work to watch Caroline and deal with the bigger kids, and we went on an adventure to the middle of America. I was nervous but so so excited. And a leap of faith. I mean...who just jumps on a plane and plans to stay in a friend's house when you've never even talked to them on the phone?? Someone who has found their tribe. For me, it made perfect sense...but for the outside world, not so much. I will never forget getting out of my rental car with Patrick to meet Jan for the first time. Her laugh and her, "You're so much taller in real life!" Meeting her sweet husband, Jeff, and their son Nash and then meeting so many others was so so beautiful. I still get chills thinking about it. And then there was the bittersweet reason, meeting Annette. Nothing could hide the brutality that there was an urgency to our finally meeting. There was no soft place to land. I met Annette and her husband Tom and her son Ryan and their other son and no longer could use the distance as my shield. Right here. Right now. This was happening. For those of us on the inside, we know about the odds and life's little twists and turns. We know that the hand can get crappy and you might not have any cards to play...but this was just plain cruel. Life didn't make sense...but we somehow had to stop thinking about the future and live, really live, in the moment, in these few days we had together. Annette and I enjoying the day! Annette was strong and happy and seizing the day. All of us had a comfort and a kismet that needed no words. If our kids acted up or did something unusual, we all got it. It was a level of acceptance and friendship that was something I had never experienced before. Partway through the walk Patrick refused to keep walking. Any other place I would be mortified, cajoling, bribing,and otherwise working like crazy to get him to keep walking. Here, another mom, offered me her stroller. Patrick plopped in and Brig (one of the oldest kids with Down Syndrome in our group) pushed him. Just like that, problem solved. After the walk, we went back to Jan's. We celebrated our children "with a little bit extra" -- the reason for our friendship -- and our hearts. We talked into the night. We played with the kids. We gossiped and watched love bloom between Brig and Hannah (they are still going strong today!) and mostly felt the comfort of friendship, the cloak of acceptance, the fleece blanket of love. It was a remarkable week-end. One I will always cherish. All thanks to Jan and the others who decided to make it real. Just a few weeks later, we got word that Annette had passed away. It felt so sudden and shocking. We were breathless and bereft. Jan and Shannon offered to attend the funeral on our behalf. They would speak for us. Together they would show our love in person. The outside world might not get it, but Tom would. Six years later, my soul sister Tara Marie reminded me of that awful, beautiful time. echoing the words of Warren Zevon's song, Keep Me In Your Heart For Awhile. Annette, there is no doubt, you are in our hearts. Always. And for more than awhile...forever. a reminder for how to live every day. Smiling and full of life.